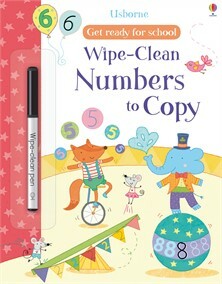 This colourful wipe-clean book is full of friendly animals learning to write numbers. Young children will enjoy drawing over the outlines of 5 mice doing some digging, boats shaped like the number 4 and more, learning key counting, ordering and pen control skills along the way. The wipe-clean pages mean this book can be enjoyed again and again.